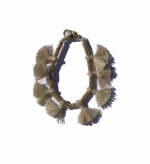 We absolutely love this brass and cotton tassel bracelet. This handmade piece is a great addition to any bracelet stack. Colored tassels make this bracelet fun, flirty and very versatile! This bracelet measures 8 inches clasp to end and features adjustable loops. This piece is handmade by working women across the globe and we are proud to support them.